This spinach salad is an old family favorite; Even the salad haters in our family LOVE this! That includes my son in law who usually only eat things that are between 2 slices of bread. 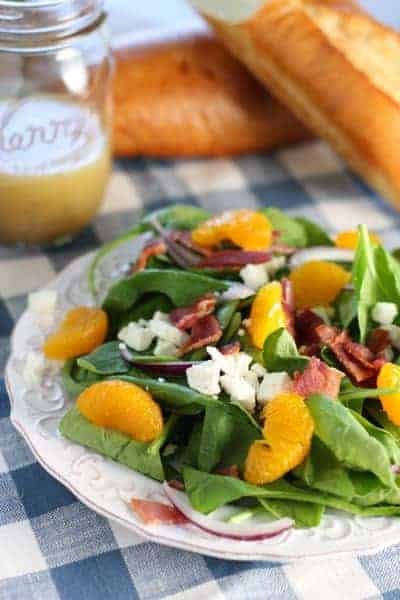 With feta, mandarin oranges, and bacon – who wouldn’t love it? This spinach salad is a winner for everybody, and comes together quickly and easily. You can add some crunchy romaine or even switch out the bacon to chicken to change it up. It’s a good, gotta be in your recipe box, kinda salad. You can even save the dressing to dip chicken in! NOTES & TIPS: You will not use all the dressing. Add a tablespoon at a time until you reach the desired amount and careful not to over-do. DO NOT toss until you are ready to serve…this salad wilts quickly! This zesty and fresh salad is quick to make, and definitely delicious! 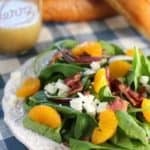 A true easy and healthy recipe, you'll love the homemade dressing and the salty sweet combination of the oranges and feta cheese together. Yum! Combine all dressing ingredients in a small container or jar. Shake, shake, shake and put in the fridge to chill. 30 minutes should do it.